When someone mentioned the great Marilyn Horne to me recently, I confessed Ms. Horne--Jackie to her friends--had been my first operatic idol. I think I had first seen her on The Tonight Show with Johnny Carson back when people cared about more than Jersey Shore and whatever faux competition TV show is popular now, and also on reruns of The Odd Couple, when she had an occasional role as as a shy friend of Oscar Madison. Here is the Wikipedia bio about her remarkable life and career. How could I not be enamored with singing like this? An early audio recording--as Beethoven's Leonore! 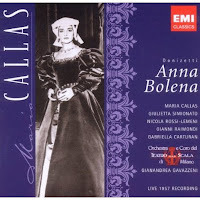 Anna Bolena is always touted as "groundbreaking" and a moving away from talented parody of post-Rossini/Mayr et al. regular practice and general conventions of the time. Seems to me more of a culmination of Donizetti's absorbing all those influences and making something of his own out of them. He shows his genius first and foremost in the melodies themselves, which have so much character and, where appropriate, vigor, as compared to most others of the time and the years immediately preceding 1830 (Do you know the Opera Rara sets "One Hundred Years of Italian Opera" - 1800-1810, 1810-1820, 1820-1830? Three sets--that's as far as they've gotten.) The ensembles in Bolena are really creative - the Act I quintet, for example, starting in canon (reminded me of "Mir ist so wunderbar"). And the final scene is really amazing; for what may well be the first time in Italian opera, the jarring sound of the banda is dramatically appropriate: the premature celebration of Giovanna and Enrico seems even more appalling with the merry noise of the banda intruding on so solemn a scene. It also helps break the melancholy (the cor anglais solo so appropriate to the drama at hand) and lead into Anna's moral triumph of "Coppia iniqua". A fine work. 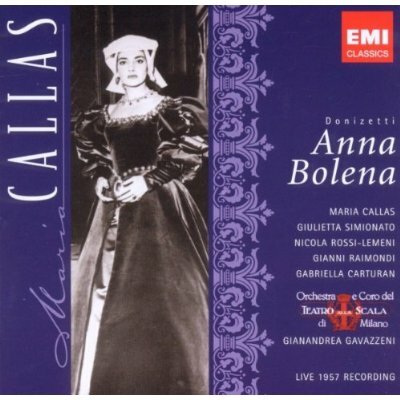 The Callas recording I find most stimulating. (EMI: Live recording, Teatro alla Scala, 1957; Gianandrea Gavazzeni, cond.) She and Simionato are just marvelous. Maria was in quite good voice on April 14, 1957: there are very few squally passages and almost no hooting from the over-covering which she often found necessary. 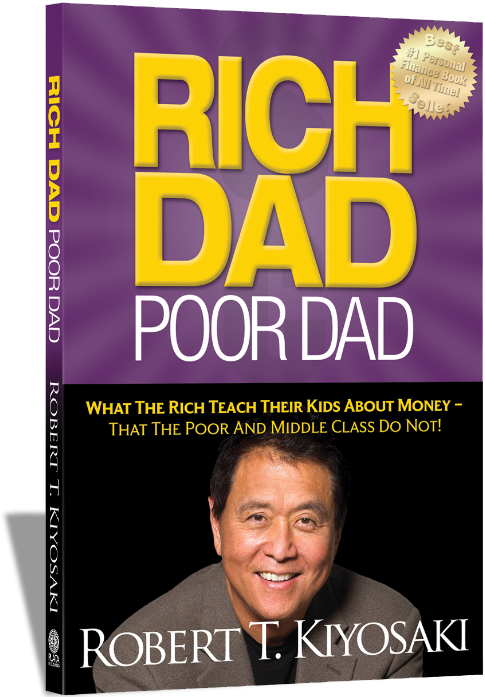 Most sympathetic in the final scene, and every word is crystal clear. Gianni Raimondi is quite good, clear in diction, heroic in tone without bellowing. Simionato excellent, fiery as always but not forcing. Rossi-Lemeni is adequate but I heard no regal menace. The cuts are so deep that the rest of the cast haven't much to do. Carturan, the Smeton, is one of those gargly Italian mezzos never helped by the recording technology of the day. Gavazzeni is adequate and the La Scala orchestra seems fine from what one is able to hear from the recording. The sound picture is mostly one-dimensional and boxy, typical live recordings of the time. I would not want to judge the opera without it, however. 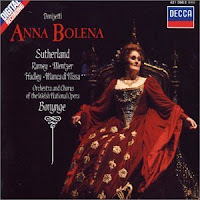 So Dame Joan supposedly said she wanted to do Bolena shortly after her 1959 triumph as Lucia. If only she had done it back then, live and in the studio. 28 years on she had taken on that martonly sound. 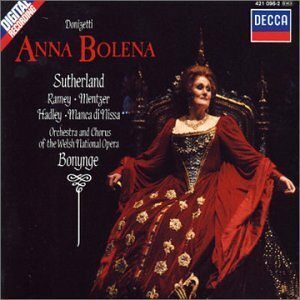 (Decca: Welsh National Opera; Richard Bonynge, cond.) She sounds far too mature for Anna; nevertheless, she sings beautifully (although not without some effort). Her diction is, as ever, rather sketchy, caused mainly by the covering from that projecting upper jaw (this also contributes to the matronliness). When she opens up or floats the tone in clear head voice, the gleam immediately returns. The characterization is not as visceral as Maria's, but it is appropriate. Ramey is in his prime: no wobble, clear diction, spot on coloratura, and dramatic: always cantante, but a great deal of menance comes through, as well as Enrico's immense egotism. Hadley sings well, although I often find his tone annoying--he tends to the bawling side of things too often. Mentzer very good in the studio, but I'm not sure how well she would handle such a role in the theater, particularly a large one. Manca di Nissa as Smeton is really very good: truly lovely bel canto singing and excellent coloratura. Bonynge and the WNO do a good job, although the overall balance seems slightly off (but I was in the car). The usual big Decca sound. Had Joan recorded this 20 years earlier, perhaps even 10, it could be a clear winner. As it is, it's good, but not great. So I'd want to keep both. I will listen to Sills soon (perhaps on the next road trip); perhaps I should get the Gruberova or the Gencer.